Compostion/Content Interesting subject but I also think it could use something else to set off the waffle. Maybe not quite so close and a pat of butter or some syrup. It's a good closeup and meets the challenge but lacks that 'Wow' something. Maybe even some whipped cream on it, not really sure. Camera Work/Technical Excellent focus and exposure. Overall Opinion Meets the challenge, looks good and appetizing, but could use something else to set it off. Another idea might be to get closer and create an abstract out of it or use more dramatic lighting to create shadows and depth. Nice shot! 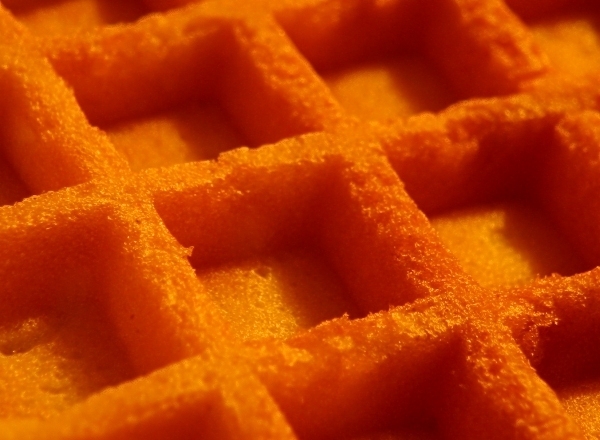 A Dempster's Bakery Waffle - fresh, not frozen. And sad to say, that is really the color of them!! Sort of a nice appetite-inducing orange. Since the challenge was "square" I thought I would try to get one square of the waffle in focus and the rest of the photo a bit out of focus. I don't really think maple syrup would help with meeting the challenge. Message edited by author 2003-02-03 09:25:16.
great work, bonus points for not using a superfluous border. Needs something more too attract the attention such as a drizzle of maple sirup or any other eye catching detail. Good lines. I love the texture in this image, and it has succeeded in making me hungry! you image looks very nice but it isn't very creative. Good work however. Nice macro and most definitely a square! Seems a bit too orange but a nice shot. Nice macro. Very clear shot. Makes me want to have some! Great close-up shot! Good texture and color. Nice. Proudly hosted by Sargasso Networks. Current Server Time: 04/24/2019 08:15:33 AM EDT.